We have a great show planned for you tonight Tues 11/27 at 9pm ET. 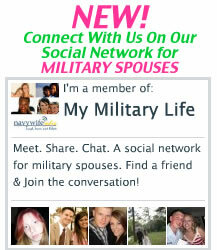 We are talking to Navy Wife Alecia about Port Calls. The ins and outs, how to plan for one, how to stay flexible, her tips advice and more. We are also talking to Alecia about her online business the Paisley Palmetto that features unique “Navy themed” items for this holiday season. Also in the show we are talking about our Health Corner, my personal progress on my fitness plan, the Billy Blanks challenge on Military Spouse Magazine and more. Just in Hey, Shipwreck creator Pat Hrabe will be dropping in to talk about his new DVD release! It makes a great stocking stuffer for your man! Be sure to mark your calendar, you don’t want to miss this show LIVE! We will be taking your calls!Our call in # is 646-652-4629. Tonights Show features Alecia, the founder of The Paisley Palmetto.